Serious about getting superb sound from your vinyl? Here’s a phono stage that really brings your records to life. Here’s ANDREW BAKER’S in-depth review of the Phono Master. When I posted a photo of the Phono Master on my Instagram account, my wife commented on how strange it is that a small metal box could get so many likes. I’d go one further and say it’s strange that a small metal box from a company that most people haven’t heard of can get so many likes. I put it down to the fact that not only is it a phono stage in this era of renewed vinyl-excitement but quite probably the four little tubes poking out the top – tubes get a lot of love nowadays, too. There is also the undeniable fact that it looks so darn cool. The story of Acoustic Plan is quite like that of Dutch audio company Metrum Acoustics – and is my favourite kind of hi-fi story – in that it’s founder Claus Jackle of Germany, a music lover, decided to have a crack at building hi-fi components himself, to get the specific sound he craved. After 15 long years researching the reproduction of recorded music and its inherent problems he founded Acoustic Plan back in 1996. Jackle’s aim was to attempt musical perfection using innovative design techniques and components, along with that archetypally exceptional German engineering. 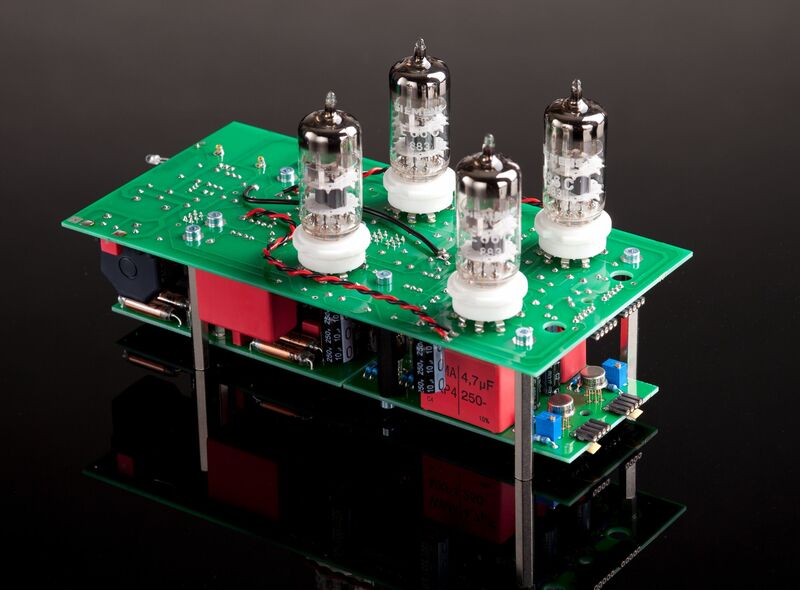 Although most Acoustic Plan products (including amplifiers, DACs, CD players and phono stages) employ tubes in their circuitry, they are integrated using hybrid methods. This means that where transistors are arguably superior to tubes, such as at the moving coil phono input or power stage, they will be used instead. What I like about Jackle’s philosophy is that he realises music reproduction is literally just that: an approximation of the real thing. You will probably never get your living room to sound exactly like a proper concert hall but you can of course get it sounding wonderful, just in a different way. Disclaimer: please don’t take offense – no one is judging your musical tastes. [Yeah right! – Befuddled Ed]. 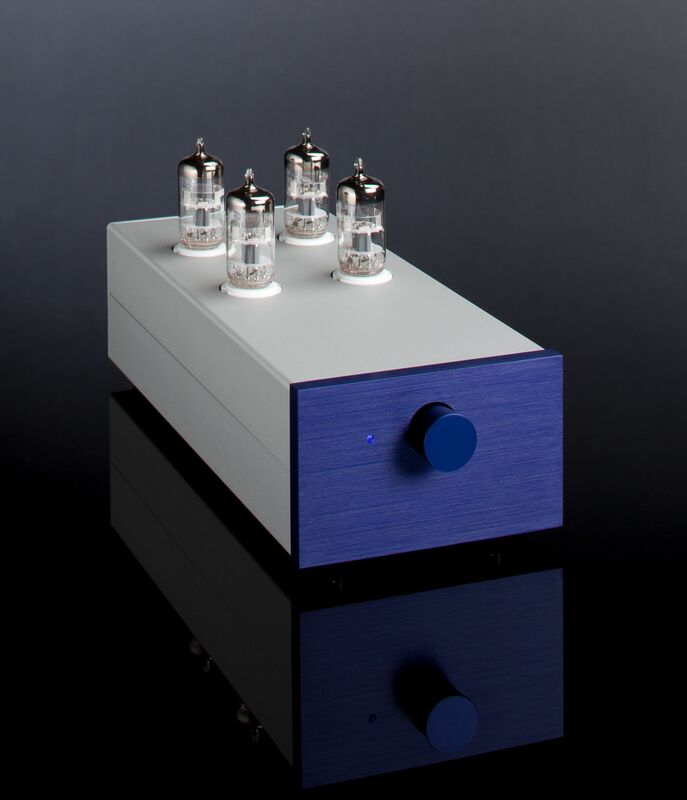 The Phono Master uses four EC86 preamp tubes which free-stand out of the top of the unit while a rotary-type on/off knob and a blue LED indicator are all you will find on the front. Thus, it’s a fairly minimalist look but with the silver case and front plate, it is rather stylish and arty looking and at 105 x 125 x 255cm (w x h x d) it isn’t exactly imposing. 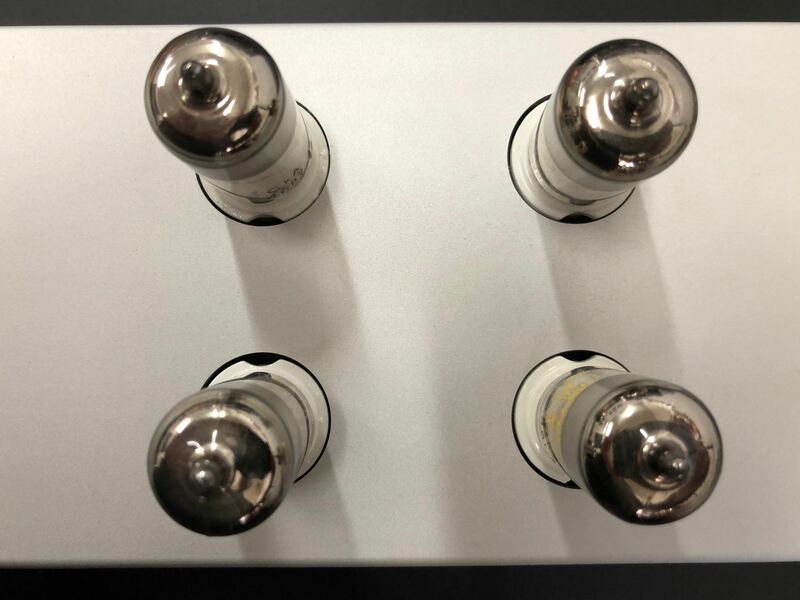 Around the back there are inputs for moving magnet cartridges (MM, 4mV, 47kOhm impedance) and high and low output moving coil cartridges (MC, 0.1mV and 0.4mV respectively). These can be selected via toggle switches found between the RCA inputs. Impedance selection for moving coils is automatic due to a current control circuit so there is no need for any user adjustable settings. The low output MC setting uses step up transformers to boost the signal from the cartridge. Therefore, if you have a low output moving coil like I do, there is the choice of using either your own SUT running into the MM input or the one built in. A wall-wart type power supply comes as standard with the Phono Master but an outboard power supply in matching casing – the Power Master (!) – is available for extra cost. This review was conducted using the standard wall-wart plug. I tested the Phono Master using its onboard SUT/MC input, fed by my custom hot-rod Lenco L75 and Analog Instruments ‘Apparition 12’ 12-inch tonearm, which is fitted with a low output moving coil EMT TSD15n cartridge (0.21mV output). This proved an excellent combination. I did, for some of the time, use my Auditorium 23 SUT plugged into the Phono Masters MM input and found it seemed to inject that extra little something: more atmosphere, finesse and in-room presence. It never ceases to amaze me how that tiny little box can be so invaluable but this review was conducted mostly with the onboard SUT/MC in use as it’s no knuckle-dragger itself. I was also able to use a Denon DL103R MC (0.25mV output) mounted on an Analog Instruments one-off 14-inch tonearm, with a vintage Siemens SUT thrown in for good measure. What fun! It was completely without thinking that the first record I chose to listen to with this German-made phono stage was Saw Delight (1977) by German experimental rock band Can. (Please allow me a slight digression here.) Can are one of my all-time favourite groups, so I was understandably upset to learn of the death, on September 6 (New Zealand time) of bass player and electronic wizard Holger Czukay, the third founding member to leave us and the second this year. Anyway, he has left us with quite a body of work, from his time with Can to his solo releases and collaborations so he is, in one respect at least, still with us. Then, only a couple of hours after reading about Czukay’s passing, I learnt of the death of another musical hero of mine, Celia Mancini from New Zealand band King Loser. I played King Loser’s music so often during the ‘90s that every note, beat, screech and wail is ingrained in my soul. I met Celia several times in Turned On Audio of all places (see, this isn’t a total digression) and she was as bonkers and rock‘n’roll off stage as she was on. I mean that in the best possible way – she was a wonderful human being. It’s almost a year to the day that I saw the newly reformed King Loser perform at The Other’s Way Festival and they absolutely nailed it. Respect to you both. Anyway, back to Saw Delight. I think the reason my EMT cartridge goes so well with the Phono Master (not to mention my A23 and Fi Yph) is that it is so good at enabling the listener to focus on the textural or timbral elements of the music – what reviewer and blogger Jeff Day would describe as ‘Timbral Listening’. Basically, this is where you can easily hear the unique tones or voice of each instrument and how they work together to create the overall sonic picture. The other elements of the listening experience – sound staging, imaging, detail, et cetera – are all present but somehow not as vital. This pairing created a sound that was big, bold, lush and deeply textured. It had the strange effect of being both relaxing and invigorating – which apparently was pretty much the goal of the phono stage’s creator. Saw Delight washed over me in rich layers of funky polyrhythmic grooves, a moving stream of sound that scooped me up and took me along for the ride. There’s funk, reggae, disco even, so it’s quite unlike their earlier albums and doesn’t really get the love it deserves, but I highly recommend you give it a go. There was plenty going on in the way of instrument tone colour – where you can easily tell one instrument from another even if they are playing the same note – and the Phono Master dished up harmonies and melodies like some exquisite meal for the ears. (God that’s a terrible simile; shame on me.) I found myself enjoying the flow of the music and definition of tones with more ease than usual, and could distinguish individual notes from within the mix. With bass notes for instance, I could hear the edges of the notes as well as their duration from the initial pluck to its decay. This helped increase the perception that I was listening to real instruments. The EMT sounded right at home fed directly into the Phono Master’s low output MC/SUT input where its natural character was nicely realised and with plenty of gain. Adding my A23 SUT into the mix gave increased headroom and dynamics and brought everything further out of the speakers. That sense of being able to hear into and around instruments which moving coils do so well was also improved. I would happily live with either configuration, however. Interestingly, with the Denon DL103r straight into the Phono Master’s MC/SUT, the sound was a little thin and the treble hot. I’ve always found the Denon 103r a little over-trebly but its slightly warm and rich midrange usually makes up for that. Although I could easily live with this combination, for it is indeed lovely, I felt the sound was just a touch too high frequency focused and lacked a bit of body compared to the better cartridge. Placing a vintage Siemens SUT in between the Denon and the Phono Master’s MM input added some welcome warmth which also seemed to bring the treble down a notch. The sound was a bit more closed in but more natural overall. Some might assume given that the Phono Master is mostly tube-based that it is going to have a warm character. While it is quite true some tube gear can have what is often referred to as ‘that lovely tube warmth’ this is not necessarily the case. In fact, sometimes the complete opposite can be true. The Phono Master, in my experience, sits somewhere in the middle. And because of its easy, free-flowing nature, where there is inherent warmth within a recording it can come through without over- or under-emphasis. The drumming on Count Basie’s Basie Jam, for example, or the articulate bass lines on Bobby Charles’ self-titled LP. I enjoyed hearing the colourful sound of drum skins being bashed on Black Sabbath’s ‘War Pigs’ from their 1970 album Paranoid. Bill Ward’s exuberant drumming was relayed with particular vigour and I could easily imagine him going loose on his kit. All aspects of the sound were electrifying and gripping – the heavy electric guitar riffing, Geezer Butler’s dextrous bass playing or Ozzy’s at times intense howling – but it was the drums that especially gave my speakers and room a good workout. It was here the Phono Master showed it was quite happy delivering dynamics and transients when required. When I can close my eyes and put myself in the place of a musician – Ward in this case – I know I’m really enjoying myself. I listened to a couple of my mono records too: Aretha Franklin’s superb I Never Loved A Man The Way I Love You (1967) and Naomi Shelton & The Gospel Queens’ equally brilliant Cold World (2014). The sound was, of course, dead centre with no stereo imaging and the performers were mostly stacked one behind the other, but with no detriment to the enjoyment of the music. The women themselves were the focus, both of whom sounded wonderfully expressive and impassioned with an almost walk-around holographic presence; something which doesn’t always quite come across as intensely with my own setup. The accompanying musicians and backing vocals were dialled back but of no less importance to the musical picture. Listening to mono recordings can be a rewarding experience, even when using stereo equipment. To that end, a mono switch may have been a worthwhile addition to the Phono Master, but even without one I enjoyed the music. Tina Weymouth from Talking Heads (and Tom Tom Club, of course) is one of the top bass players in the business and scandalously under-recognised. Her bass lines are instantly memorable and those iconic minimalist bass notes which construct the foundation to Talking Heads’ ‘Psycho Killer’ from their 1977 album Talking Heads:77 help give tension and drama to the disquieting lyrics. They came across with good body and resonance, each note nicely separated and decaying naturally. There was a satisfying level of depth and funk and I was later compelled to grab my own bass guitar for a round of (pale) emulation. I love Talking Heads’ artful mixture of funk, frenzy and dynamic swings and the Phono Master communicated this well, giving a good impression of what all the instruments – including vocals – should sound like and without losing pace. Giving ‘Psycho Killer’ a listen with the Denon 103R, I found the bass lost some depth and appeal – not too horribly but it was noticeable when compared to the EMT and with the Siemens SUT which enriched things with that little bit of warmth it gives. I only tested the Phono Master with the two cartridges so I hardly have a definitive impression but as with any phonostage, I do suggest careful consideration should be taken with choosing/matching the ideal cartridge for your situation – I’m sure Mr Young will have a wealth of ideas. To be fair, I could happily live with the 103R and the Phono Master together. They do sound superb, but spending a bit more is likely to give even better results. With the EMT, a direct comparison between the Fi and Phono Master phono stages revealed a slightly better rhythmic interpretation, a more natural flow of music and increased definition of instruments through the latter device. Even David Byrne’s distinctive and vibrant vocal sounded more natural and unforced, every nuance out on display. The Phono Master certainly has more gain and headroom and sounds as good at low volume as it does when given a crank to more natural levels – around 80dB or so in the room. My Mobile Fidelity Sound Labs 2014 reissue of the Grateful Dead’s American Beauty (1970) sounds fresh and alive rather than straining against the accursed expanse of time and tired, worn wax and the Phono Master helped to give an extra boost of life to Jerry and the boys. The richly textured presentation was simply blissful and the band’s playing was as swift and rhythmic as ever. ‘Operator’ sung by poor old Pigpen aka Ron McKernan (unfortunately a member of the dreaded ‘27 Club’) has always been a standout track for me. This was, more or less, his swansong which makes it all the more poignant. Pigpen was possibly the only one of the original members who could truly sing the blues and here he was alive and well before me, his husky voice only just showing signs of the strain of his drinking and disease. Meanwhile, the rollicking bass of Phil Lesh thundered lavishly, complementing the virtuoso pedal steel blues and cosy acoustic guitar while the brief burst of harmonica was bright and colourful. On ‘Truckin’, possibly one of the best rock songs ever recorded, the bass was again thunderous and grunty, accompanied by Bill Kreutzmann’s relentless drumming. With the Fi/A23 combo the bass on this track was just as full-on but got a bit muddled in places and the drumming, though just as enjoyable, wasn’t quite as coherent or dextrous sounding. When listening with the Phono Master, that relaxing effect I’ve mentioned was as evident as ever. It isn’t so much a feeling of easing back into your seat with pipe and slippers; rather, you are put into a state of ease where nothing but the music matters. Having gone straight to my ‘audiophile quality’ records (meaning heavy vinyl pressed from the original master tapes, remastered at half speed at Abbey Studios ad nauseum) and had the impression that the music was being pulled off the record and out of the speakers just as the artists’ had intended, I assumed my ‘lesser’ records were going to sound not so good. I was pleasantly surprised to find this was simply not the case. The Phono Master didn’t make them sound amazing but neither did it accentuate the bad points – the compression, the glare, the cocaine treble. Even surface noise didn’t bother me, although that is something I’ve long since learned to live with. The enjoyment of music is clearly the aim of this phono stage, and it succeeds on nearly every level. I would add the caveat that it could be dependent on your system or your audiophile sensibilities. If you want to be wowed by pinpoint imaging, vast three-dimensional sound staging and ultra-detail you might have inclination to overlook the Phono Master. Then again, I might advise you to give it a try anyway as it could just change your view on how music should be listened to. Not that there is a right or wrong way by any means. The appeal of the Phono Master is its inherent ability to convey the textural elements of music – the timbres and colourations that make music interesting and real. The emotion and the intent of songs and pieces were given equal importance. It certainly seemed a little different to the usual audiophile experience and I welcomed that with open ears. I love the way it just gets stoically down to business, bringing the life and natural colour out of the records, even making average recordings listenable; acting as servant to the living, undulating force that is music. The Phono Master is effectively just like the Fi in the way it aids the listeners’ appreciation of timbre, rhythms and the like, only it’s on an acid-trip – not just the introspective variety, but also in terms of vibrancy and perception – to the next level. From the beginning of the very first record I played, it was evident that the Phono Master was going to provide something of a change from the usual audiophile listening experience. My initial two reactions involved the free-flowing nature of the music and the wonderful textural insight. These two attributes remained throughout my all-too-brief time with the phono stage and they contributed to what I must say is one of the most natural and lush sounding presentations of music reproduction I’ve heard. I’m not saying the Phono Master made me believe I was at a live event, rather it reproduced what was cut into the record in as natural a manner as it could. My living room may not have been turned into a pulsing replica of a live venue, but I got to hear instruments sound as life-like as possible. Sure, there was depth and fine imaging and all that, but audiophile pretensions went straight out the window for me as I listened in a way I don’t get to do very often. It communicates the textures, timbre and emotions of music with ease and it’s a bit of an all-rounder, not being fussed on genre or recording quality. The Phono Master is one of those components which makes you forget it is even there as you find yourself drawn deeper than ever into your music. That’s not to suggest it isn’t important because you will be sure to miss it when it’s gone – I most certainly do. In New Zealand dollars it does seem pricey – and the cost will be upped considerably if you wish to add the Power Master power supply – but when you consider the American price is $US4495, it is actually a lot cheaper here. Besides, I think you will come to agree, it is totally worth it.